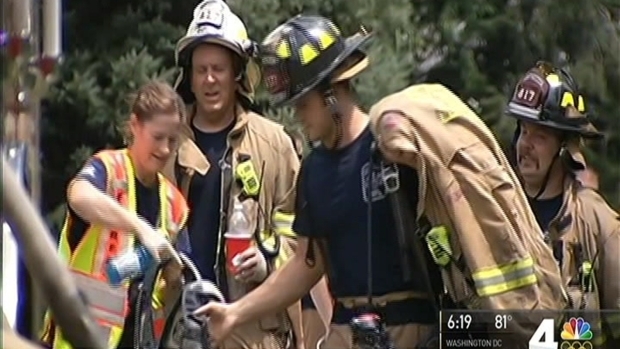 Police have identified the toddler who was found slain inside a burning Fairfax home on July 27: She is Kyra Franchetti, a two-year-old who family members said loved listening to "moo-sic" and watching family videos on television. Kyra died of a gunshot wound. Her biological father, Roy Eugene Rumsey, also was found dead in the home of a gunshot wound. Police have been investigating the deaths as a murder-suicide, but until Tuesday had not identified the toddler. Authorities discovered the bodies when firefighters were called to Rumsey's home, in the 12100 block of Fairfax Hunt Road, for the report of a fire. Investigators are working to figure out what led to an apparent murder-suicide in Fairfax County. A little girl was one of two people found dead in a burning home. Northern Virginia Bureau reporter David Culver reports. Police said Tuesday that they found multiple gas cans in the burned-out home, and that the fire had "multiple points of origin." NBC4 has tried to reach Rumsey's family, but they did not return phone calls. "Kyra was adored by her family," reads Kyra's online obituary. "Kyra was a chatter box and easily made friends wherever she went," the obituary reads. "She loved bubbles: blowing them, catching them, and taking bubble baths." Among the survivors was "her mother, Jacqueline, who misses Kyra every second of every day." "I'm just hoping for the best and that the child didn't suffer too much," neighbor Liz Moysey had told News4. She said she had never seen a child at the home. Video taken from Chopper4 shows the roof of the house burned down to the beams. From the rear of the house, what appeared to be scaffolding was visible. Sixty firefighters battled the blaze, which took 40 minutes to bring under control amid temperatures in the 90s. "There were 20- or 30-foot flames coming out of the roof over the garage," Moysey said. Anyone with additional information for investigators is asked to call 1866-411-TIPS or 703-691-2131. Kyra's family asked that, in lieu of flowers, donations can be made to the R Baby Foundation.